Amid the milieu of fierce deliberation and uncertainty that defined much of the 21st Conference of the Parties (COP21) in Paris in late 2015, primatologist, conservationist, and UN messenger of peace Dr. Jane Goodall offered a message of hope. 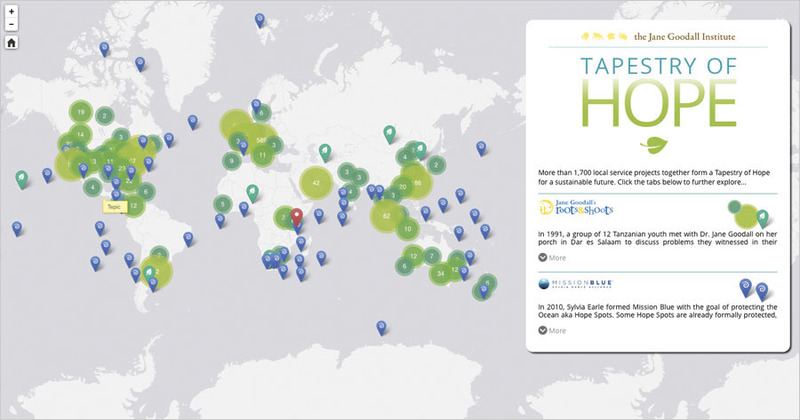 Along with renowned marine biologist Dr. Sylvia Earle, Goodall launched the Tapestry of Hope, an interactive online map that documents thousands of projects around the world that young people are establishing to benefit communities and animals who share the earth. The Tapestry of Hope, a customized Esri Story Map, pinpoints youth-focused projects on a world map. The map, released December 7, tracks the on-the-ground impact of Roots & Shoots, a youth-led community action program from the Jane Goodall Institute (JGI) that inspires young people the globe over to do projects that protect the environment. The Tapestry of Hope, a customized Esri Story Map, pinpoints youth-focused projects on a world map and lets users click on individual points to explore them in greater depth. In Mashhad, Iran, for example, kids, teenagers, and other volunteers founded the Kavikonj Nature School—the first of its kind in the country—where urban youth, who otherwise have little access to nature and wildlife, plant trees, manage a small farm, and learn to care for the environment. Community members in Iida, Japan, are trying to set up an ecology learning park in the city and are working with the local government to acquire land for their park. In Nairobi, Kenya, students from Eastleigh High School’s Clean Up Young Youth Club are removing trash from a 300-meter section of the Nairobi River. And in Crete, Nebraska, members of the community are operating a thriving community garden. The Tapestry of Hope also highlights Hope Spots—areas of the ocean that are either already protected or that Earle and the Mission Blue initiative are seeking to preserve. With less than 4 percent of the ocean sanctioned for preservation, the pinpoints in the story map not only spotlight marine protected areas but also single out locations that, without formal safeguarding, will remain seriously threatened. Esri technology, which powers the mapping behind JGI’s conservation work, forms the basis of the Tapestry of Hope. And now, the collaboration includes illustrating how all actions, big or small, can truly impact the natural world. The historic 2015 Paris Climate Conference resulted in 195 nations committing to taking concrete steps toward permanently reducing greenhouse gas emissions. As countries seek to implement their plans in the face of myriad challenges and ongoing disagreements, the Tapestry of Hope will continue to let people visualize all the conservation work that global youth—who care deeply about the world they will inherit—are bringing to fruition.